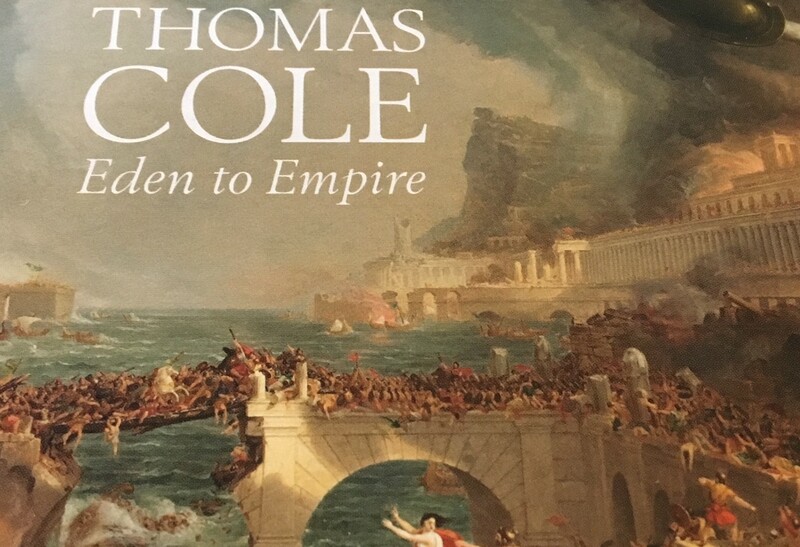 The environment and preserving the natural world has never been a hotter topic (literally, given our current heatwave) and the National Gallery has fittingly tapped into that with one of its latest exhibitions, Thomas Cole: Eden to Empire. Originally hailing from Bolton, England, Cole is considered the father of American landscape paintings and the exhibition features works by him that capture the raw, untamed beauty of the North American landscape perfectly, as well as some European landscapes (a particular favourite of mine was his ‘Aqueduct near Rome’ which seems soaked in that warm Mediterranean rosy sunset light, and features a lone goat in the foreground opposite a skull – killer goat?). The Catskills Mountain range and New England are a repeated subject, with the message of ‘preserve nature, industry destroys the environment’ threaded repeatedly through the canvases. The motif of the savagely chopped tree trunk crops up again and again to highlight this, such as in one of his most famous paintings ‘The Oxbow’. It is not the American landscape Cole turns to in order to really hit home his message about the dangerous effects progress has on society, it is a mythical one. His five painting series ‘The Course of Empire’, on loan from the New York Historical Society, dominates the heart of this exhibition, with powerful and clever imagery depicting a mythical land at five different stages of human progress – naturally as human knowledge and success increases, the natural landscape suffers, but the final painting ‘Desolation’ does offer the macabre solace that nature does win back its land once humans have brought about their own destruction. Look out for the heron nesting at the top of the lone remaining Grecian column in this painting – it’s brings a certain peace and harmony to what is a distressing image from humankind’s point of view. Cole is not all about hammering home a serious environmental message to viewers though – there is humour in his paintings. In ‘Desolation’ the moon has a discreet face that is winking at us and in ‘The Oxbow’ Thomas Cole depicts himself painting the landscape cheekily looking back at the viewer. This is a gorgeous exhibition that whets the appetite for viewing more of his works, and it was particularly interesting to see Cole’s paintings set beside those who inspired him (like Constable and Turner) as well as those he inspired such as Asher Brown Durand and Frederic Edwin Church (do look out for the irony of one of his students reversing Cole’s environment message in the last painting as you leave the exhibition). An exhibition definitely for nature lovers inspired by Attenborough programmes, and perhaps necessary for those who deny climate change. How can museums stay relevant to the UK’s rapidly changing population?